If you had a career before real estate, do everything you can to bring your valuable networks with you. Embrace tech in helping you communicate with clients, especially those who are out of town. Do not turn your phone off at 7 pm – you never know when a client in another time zone is going to call. It’s always interesting to discover what an agent did before they decided real estate was for them. If they are wise, they will bring contacts from their previous life with them as Josh Tucker, managing partner of Anchor Real Estate, did. And his contacts were not too shabby. Tucker worked for 10 years in NASCAR, rising to become car chief, overseeing a team of mechanics for Rick Hendrick and Hendrick Motorsports. In his last two years there, he was looking for a new occupation that would still involve his car racing connections. He’d had enough of the 200 days a year in hotels, but he still wanted to stay close to these people with whom he had spent so much time on the road. The now top-producing agent thought about car sales, but if there’s one thing a racing driver doesn’t need, it’s a car — they get deals from the manufacturers. He also toyed with insurance, but decided against it because there was a dominant player for the NASCAR community already. He found, however, that in NASCAR’s home base in Mooresville, North Carolina, members of the race car community were buying plenty of houses — and they weren’t particularly loyal to one agent. “There were no agents that really had a tie to NASCAR or who had been so heavily involved in NASCAR and then left to get into real estate, so I grabbed a hold and ran with it,” said the agent. Tucker started with a small independent company in 2012, then set up on his own as Anchor Real Estate in May this year. “I closed my first transaction in April of 2012,” Tucker said. “I represented a NASCAR engineer on the sale of his home. Targeting the upper end of the market in the greater Charlotte region, with a focus on Lake Norman, he quickly found success, selling $50 million in property in his first couple of years. He has also represented players and staff in both the NFL and NBA. “I have undoubtedly become a top producer due to relationships I cultivated within my 10 years in NASCAR,” said Tucker. With five other agents under him and two full-time staff members, including a marketing director, Tucker now has big plans to expand to other markets — starting with the nearby city of Charlotte, a popular head office location for several big companies, including Bank of America, Wells Fargo and Duke Energy. A lot of his high-earning clientele like to own coastal property in places like North Carolina’s Outer Banks, and with a license to operate in South Carolina, Myrtle Beach is another attractive place to buy. Tucker has his sights on those areas for new offices, too. “Athletes love coastal property,” he said. Many of his clients have second or third homes in South Florida, so Tucker is planning to follow the business there. He is sick of giving referrals for this potential revenue-earner. “In the next 24 to 36 months, we have hopes of having a Fort Lauderdale or Miami office,” he said. The agent has never actively recruited, preferring word-of-mouth approaches to hiring, and he would like this to continue as he gets bigger. “I have got five agents but did not recruit one of them — they said, ‘We love what you are doing and how you are doing it,'” he said. As well as new residential sales offices, Tucker would like to have a property management business and an investment arm. Tucker has two business partners who help him make the big-picture decisions. Tom McClellan, a custom house builder, is one; the other is NASCAR driver, Greg Biffle. Tucker prides himself on maintaining his NASCAR work ethic as a broker/owner, spending four evenings a week at networking or client events. “I think the biggest difference between me and the average agent is my work ethic,” he said. “The norm in NASCAR was 70-hour weeks. I have continued my same work ethic in real estate. Tucker remembers taking a call at 11:30 p.m. from an NFL player in Seattle. “He was interested in one of my listings and wanted to see it,” he explained. “It was only 8:30 on the West Coast. He ended up buying the house and I did both sides of the transaction. Tucker is a big believer in using tech to communicate with his clients who travel a lot and buy new homes frequently as they follow their careers from franchise to franchise. “Our NASCAR clients travel 42-plus weekends a year — they are gone, so a lot of our transactions are done sight-unseen,” he said. His enthusiastic approach to using tech in his job is also related to his previous career. 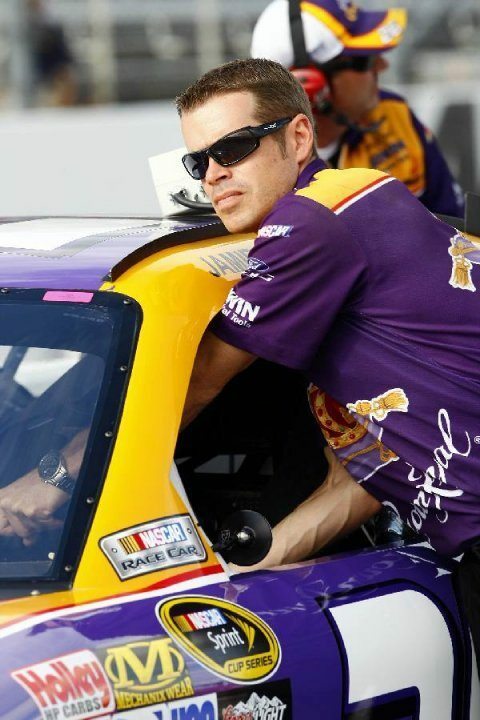 “I would say my tech interest or maybe even just my desire to always be ahead of the curve, most definitely relates to my time in NASCAR,” he said. Anchor Real Estate is one of the few in the Charlotte market that has a Matterport 3-D scanner and a drone, and they use live video for listings, he said. Tucker works hard at being very active on social media. “Twitter, You Tube, Facebook — these types of things set us apart from the others who stick with the norm,” he said. “I do all my own personal social media, and my marketing director does it personally for our firm. I think social media is very personal and don’t believe in having a third-party company doing it,” he said. In his second career, Tucker said he has been inspired by two men. “I learned a lot about business and how to treat people by watching Rick Hendrick throughout my NASCAR career,” he said. His other role model has been The Boutique Group’s Raj Qsar, whom he first saw in action at Inman Connect New York in 2014. “It’s just weird how you can go to an event and feel a connection by hearing someone speak, and that’s how I felt with Raj,” he said. Tucker has since made contact with Qsar, who has given him some useful advice. “I have tried to pattern certain aspects of my firm after his, and I think his marketing ranks near the top of any I have seen,” said Tucker. And there is one perk for having a NASCAR client list: Tucker does not have busy weekends showing clients homes because they are often traveling.